When I’m not writing, recording, touring or playing music, I love to laugh and go out to support standup comedians. I have many favorite comedians including Brian Regan, Jim Gaffigan, Kathleen Madigan, just to name a few. 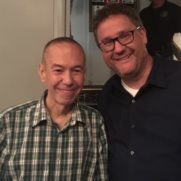 When I heard Gilbert Gottfried was coming into town I was thrilled to go out and support him.